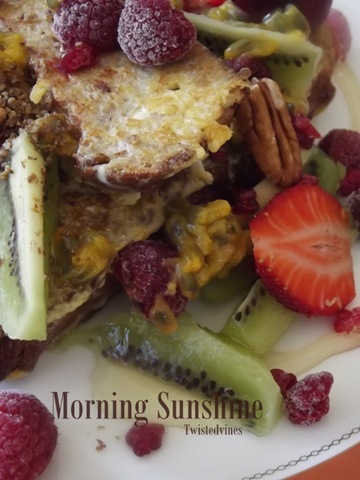 Breakfast is one of those meals where we all do something different! Grab a coffee, some cereal, maybe a piece of fruit on the run. Even skip it! It was the custom in Italy to call into a corner bar, stand and grab a quick espresso and maybe a pastry and head off to work. Here in Australia it’s anything from coffee, toast and vegemite to a cooked breakfast of eggs, bacon and baked beans. 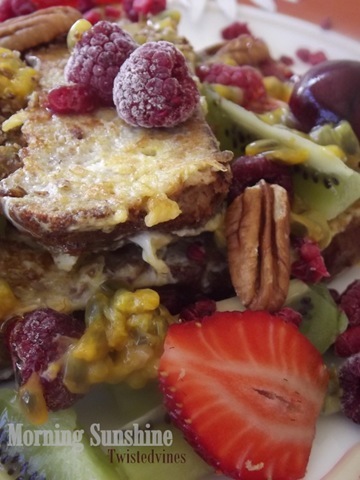 I was an oatmeal and yoghurt girl, fresh fruit or toast and vegemite…things are a changing. Bread hasn’t been in my daily diet for approximately three weeks…so of course because I love the texture of bread, I had to research a little and find a non grain substitute. 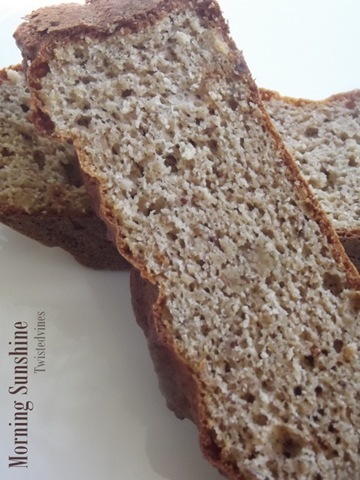 Now, the look of this bread might seem a little bland, but it has a wonderful ‘nutty’ texture, but hey not very exciting for the morning…how about a little boost of sunshine! 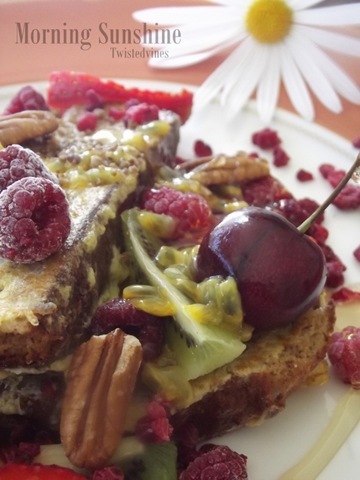 Slices of ‘no grain’ bread made into delicious french toast. Soaked in two eggs for 2/3 minutes then fry in butter. Served with fresh fruits: strawberry, kiwi fruit, passionfruit, cherries, frozen raspberries, and pecans with a swirl of honey. 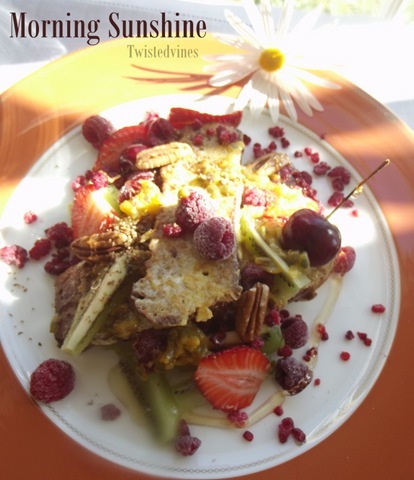 My friends let me introduce you to – Morning Sunshine. Now this is a hearty and colourful bit of morning sunshine Yvette. I’ve never been much of a breakfast person but this, Yvette, could make me change my ways. It looks so very healthy and fresh. Just right for a day’s first meal. I love Australia, but vegemite… I’m sorry I just can’t eat it, not even for money… :). We always eat breakfast, usually a half a grapefruit and oatmeal or a small slice of toast. Breakfast is an easy place for us to save on calories.